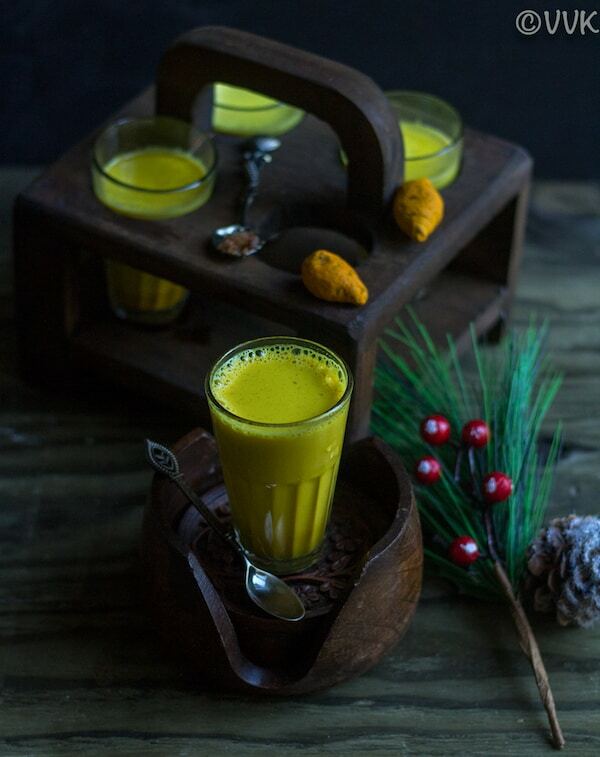 Easy Turmeric Milk aka Golden Milk recipe made with turmeric powder. 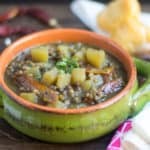 This super simple recipe needs only four ingredients, and you can prepare this under 20 minutes. 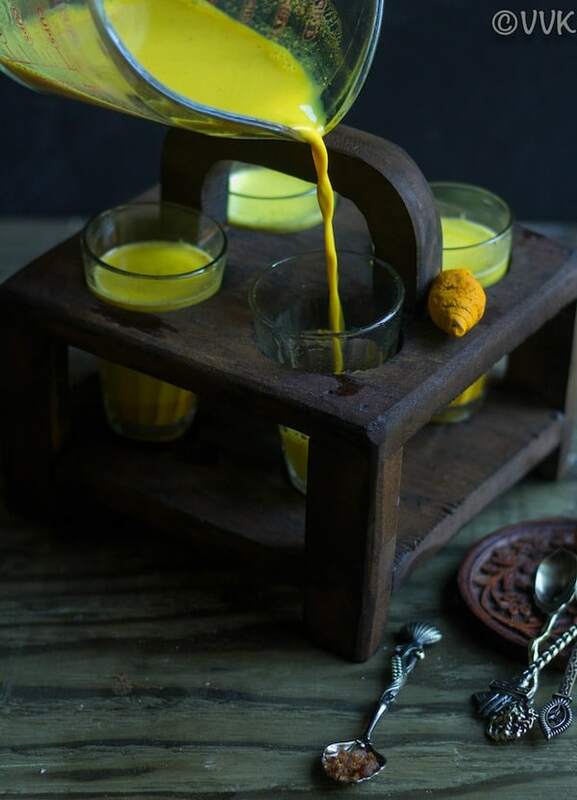 Check out this traditional turmeric milk with palm-sugar in detail. 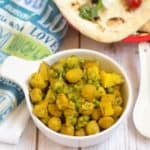 Turmeric powder is one of the quintessential ingredients in the Indian kitchen, and it is hard to find an Indian household without it. Moreover, turmeric is a well-known ingredient in both Ayurveda and Siddha medicines. The curcumin found in the turmeric gives the spice the bright yellow color. It is a powerful antioxidant. The curcumin also has antibacterial and anti-fungal properties. 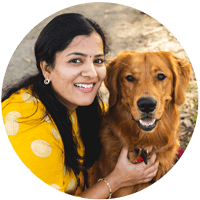 Recently, I see a lot of turmeric products and supplements here in the US. The easy way to get that turmeric in your diet is via turmeric powder. Add in your curries, rice, salad, smoothies and what not? But if you want your body to absorb all the curcumin, combine it with black pepper. The curcumin in turmeric is poorly absorbed in the bloodstream. But it can be enhanced with the black pepper. That’s why all our traditional turmeric milk calls for pepper powder. And that’s why we use turmeric in our curries along with spicy and pungent ingredients so that our body can absorb that curcumin instead of taking it orally. 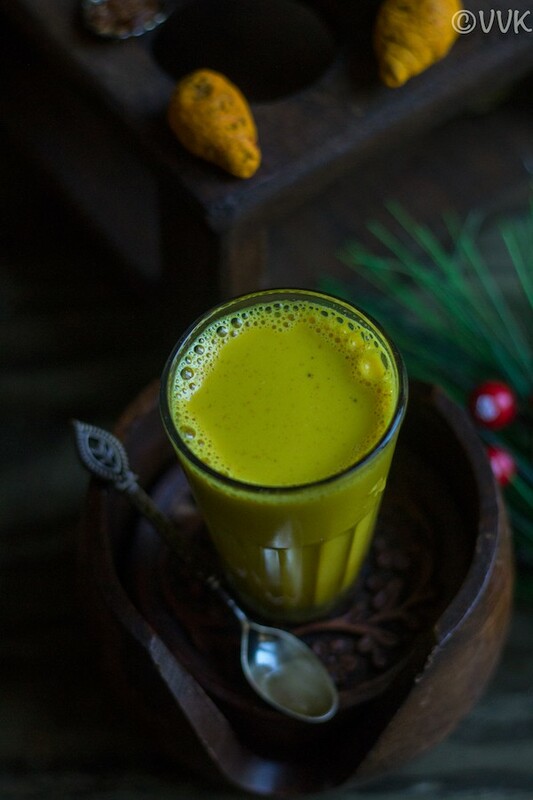 This turmeric milk or the yellow milk with freshly ground black pepper is a staple in our house during the winters. We call it Manjal Paal or manjal milagu paal. Manjal means turmeric and paal mean milk in Tamil. It is a warm and comforting drink without any caffeine. It’s a natural home remedy for a cough and sore throat. 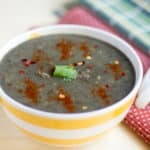 The anti-inflammatory properties of curcumin in turmeric and the piperine in the black pepper soothes sore throat issues and keeps it under control. 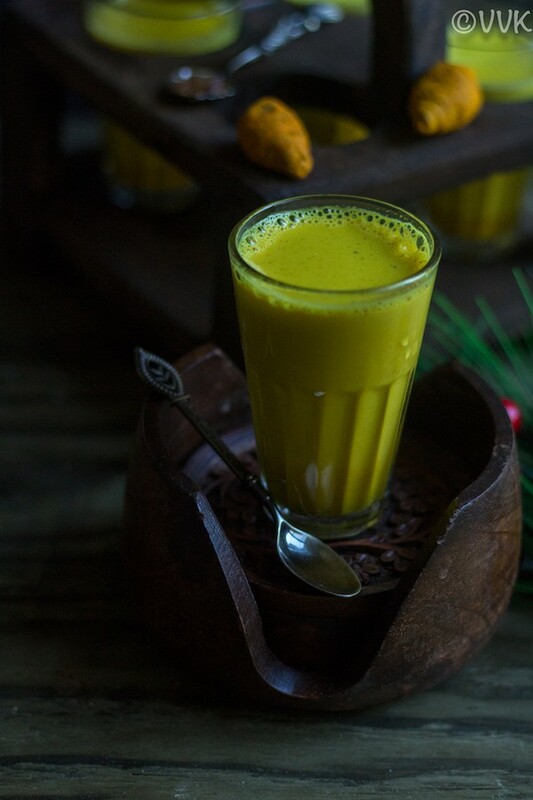 I used palm sugar or as we say in Tamil panakarkandu or panakalkandu (panam kalkandu) to sweeten the turmeric milk. Palm sugar is yet another Asian ingredient that is getting popular in the west these days. The palm sugar that I used is from the sap of the flower bud stem of the palmyra palm. The coconut sugar that is readily available these days is from the juice of the flower bud stem of the coconut palm. You can use date palm sugar or coconut sugar or brown sugar. I would recommend unrefined sugar for this drink. 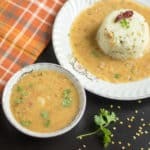 How to make turmeric milk with turmeric powder? All you need to do is, boil milk along with the turmeric powder and grated pepper. Then add the palm sugar and enjoy. That’s it. The amount of turmeric powder depends upon the quality of the turmeric powder. I love the turmeric powder that we get in Costo. You need 1/2 to 1 tsp of that for one glass of milk. I went with 1 tsp, but you can adjust according to your preference. Now without any further ado, here is how I made this golden milk. Add the turmeric powder, pepper powder and the milk in a saucepan and simmer it for about three to four minutes over medium heat. Keep stirring in between and do not let the milk to overflow. If you are using non-pasteurised milk, then bring it to a full boil. After four minutes, turn off the heat. Add the palm sugar and mix it until it is well-combined. As the milk cools, the turmeric powder gets deposited in the bottom so heat and stir well before serving. Adjust the sugar and pepper according to your preference. 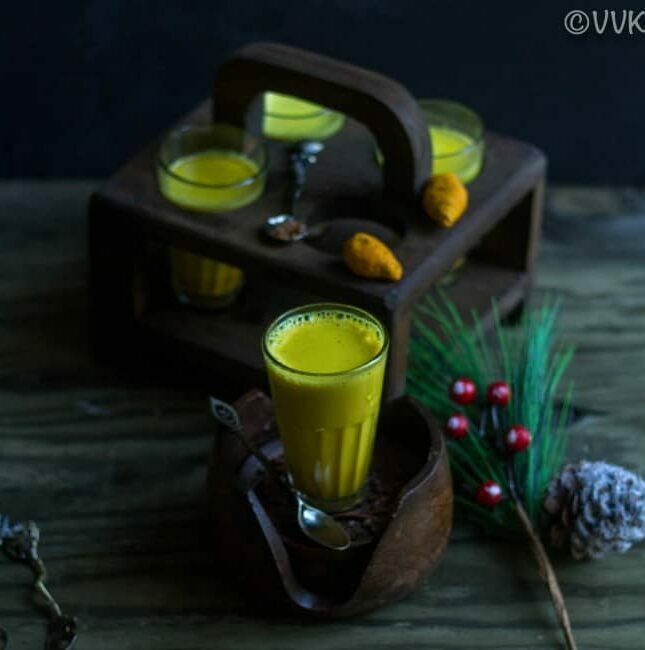 Easy golden milk aka turmeric milk recipe made with turmeric powder. 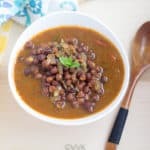 This super simple recipe needs only four ingredients, and you can prepare this under 20 minutes. Turmeric milk is very good for the body. I would opt for turmeric milk instead of health drinks available in market. Thanks Sangeetha. I totally agree with you. I love this milk.. esp during cold times.. india vacation-a? enjoy pannunga.. have a fantastic time!